Why are vanilla growers in Madagascar struggling to survive? After saffron, vanilla is the most expensive ingredient in the world, a result of its labour- intensive production process. With more than 50,000 producers, the Sava district in Madagascar is by far the most important vanilla-producing region in the world. More than half of the global vanilla production comes from the region. Despite the heavy workload and thriving vanilla economy, Sava farmers can barely survive off the land. Madagascar still remains one of the world’s poorest countries in the world and vanilla farmers live in a miserable condition—human rights abuses, political instability and violence are widespread in the Sava region. Denis Emile, a 70-year-old farmer from the Sava region, says he has dedicated at least 50 years of his life cultivating vanilla. Still he has earned just enough to support his family and send his children to school. “I should be living in a decent house made of bricks. But so far I have nothing,” he says. This is surprising because the cost of a single vanilla bean from the region is upwards of $5 in New York. When told about this, Emile wrinkles his forehead in disbelief. 'I did not have that many opportunities to go too far from here and I cannot try anymore. Now I am old. I cannot work on anything different apart from vanilla harvesting,” he says. Dominique Rakotoson, the owner of a family-run vanilla company in the region says the booming vanilla trade has only benefitted the exporters. “In contrast to our reality, vanilla exporters are all millionaires. The truth is there is too much injustice here. Because of poor education and isolation, peasants have no idea about the real price of vanilla overseas,” says Rakotoson. He adds that on an average a vanilla farmer earns just 1,500,000 ariaries (US $490) a year. Apart from poverty and social injustice, violence and robbery are widespread in the region. It is common to hear stories of armed groups invading villages to steal vanilla pods. “Many times producers have no options but to engage in armed conflicts with the criminals to protect their vanilla. In an attack at the nearby Marolambo village, the thieves killed the infant of a vanilla farmer,” says Thomy Thierry, a vanilla producer in Antanana-basa, a village that consists of four wooden houses. Farmers blame the lack of law enforcement for the violence and social injustice in the region. “It is ridiculous. Often the police let the thieves go free right after their arrest,” says Thierry. Although police officers deny these claims, other farmers corroborate his word. “Often it is the people who arrest the criminals. In some cases, they kill the criminals on their own because they no longer trust the justice system. 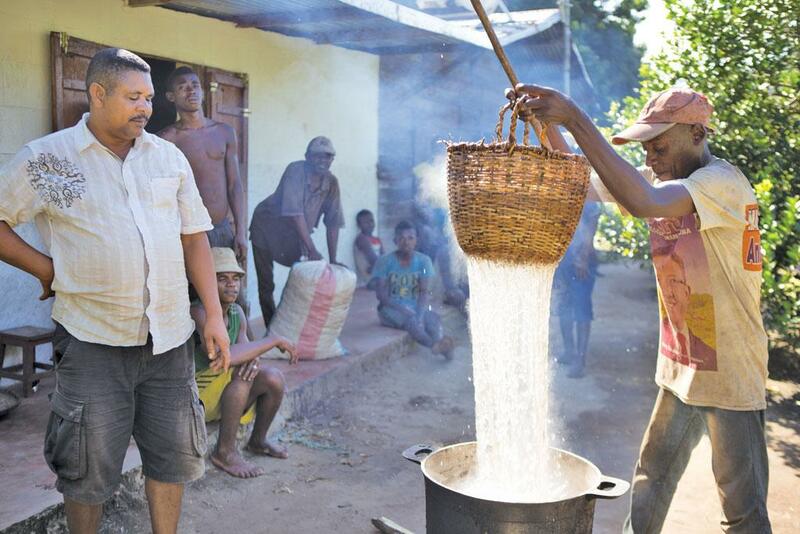 If things do not change, the Malagasy people will all kill themselves for vanilla,” says Kune Leng, a Tanambao resident. Like all other commodities, vanilla has always been subject to price volatility and market speculation. According to farmers and industry experts, the increasing global demand for the product, coupled with the social challenges in the region, has made the spice one of the most volatile commodities in the world. The price of vanilla has increased to a record high in recent years. Between 2008 and 2010, vanilla beans were sold on average $20 a kg. In 2014, the price surged to $70 a kg. In 2016, the beans were sold for over $400 a kg and prices have further increased over the past months. “In 2016, a client contacted me to buy two tonnes of vanilla. I got in touch with a major supplier and we agreed to $190 per kg. When I came back to pay he said he wanted $225 for the kg. My client accepted the new price and then I went back to purchase the product, the supplier demanded $260 per kg. And now, out of sudden vanilla costs more than $450 a kg in Sava,” says Dominique. Most people involved in the vanilla industry provide a logical explanation to this economic phenomenon: as the global demand for vanilla far outpaces its production capacity, prices gradually increase. Although the commodity is used to flavour almost everything from soft drinks to ice creams, vanilla pods are still hand pollinated and manually harvested, making it extremely difficult for farmers to increase production to meet the demands of ever- increasing global food market. Farmers, though, have a different explanation to the price surge over the years. Many blame the money-laundering problem associated with the rosewood industry. In 2010, the local government banned logging and trade of rosewood trees grown in the Sava region. Back then, the rosewood logging industry was Sava’s most profitable business— the region was one of the largest producers of rosewood in the world, most of which was turned into expensive furniture for the Chinese market. However, in recent years Madagascar faced strong international pressure to protect its rosewood trees from extinction. As soon as the rosewood trade was banned, loggers had no choice but to buy vanilla pod to cover up and clean the dirty money. The increasing demand from local traffickers, coupled with growing international consumption, has put immense pressure in local markets. “Banks can no longer accept the money from rosewood traders. All the dirty money is being used to buy vanilla in local markets,” says Dominique. “As a result, prices surge,” he adds. “Many people became millionaire off the rosewood market here,” says Kune Leng, a Sava farmer.